Help-I've got no dosh! 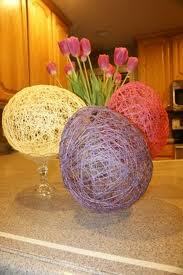 : Yarn Easter Eggs! Why not have a go at making these yarn easter eggs, which look amazing. All you need are balloons blown up and tied. yarn, pva glue and a sharp needle. Simply place pva glue on the wool/yarn and wrap around the balloon evenly. Wait for the glue to dry completely and prick the balloon and remove. This makes a great craft activity for the kids so why not give it a try? Mini eggs in a mug !